Filmmaker Madhur Bhandarkar unveiled the first look of his upcoming film "Dil Toh Bachcha Hai Ji" on microblogging website Twitter. "Check out the first teaser poster of my next film 'Dil Toh Baccha Hai Ji'.... Exclusively for you guys," Bhandarkar posted on his Twitter page. The director has moved away from his penchant for making serious cinema and this time is trying his hand at comedy. This film stars Ajay Devgn, Amisha Patel, Emraan Hashmi, Jiah Khan and Omi Vaidya. 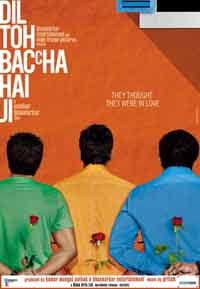 The poster of the film shows Ajay, Emraan and Omi with their backs holding roses in their hands. Ajay & Emran again give us super-hit movie after 'once upon a time in mumbai' We are waiting...!